The rocket-powered X-15 research aircraft was launched from the B-52 mothership to ensure proper testing. In this historic photo from the U.S. space agency, one of three X-15 rocket-powered research aircraft is being carried aloft under the wing of its B-52 mothership in January of 1959. 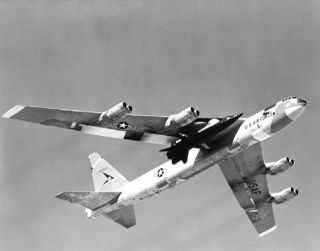 The X-15 was air launched from the B-52 so the rocket plane would have enough fuel to reach its high speed and altitude test points. For flight in the dense air of the usable atmosphere, the X-15 used conventional aerodynamic controls. For flight in the thin air outside of the appreciable Earth's atmosphere, the X-15 used a reaction control system. Hydrogen peroxide thrust rockets located on the nose of the aircraft provided pitch and yaw control and those on the wings provided roll control. The X-15s made a total of 199 flights over a period of nearly 10 years and set world's unofficial speed and altitude records of 4,520 miles per hour (Mach 6.7) and 354,200 feet. Information gained from the highly successful X-15 program contributed to the development of the Mercury, Gemini, and Apollo manned spaceflight programs and also the Space Shuttle program.